After our long day of travel and crossing back into the USA we were tired and slept in yesterday. 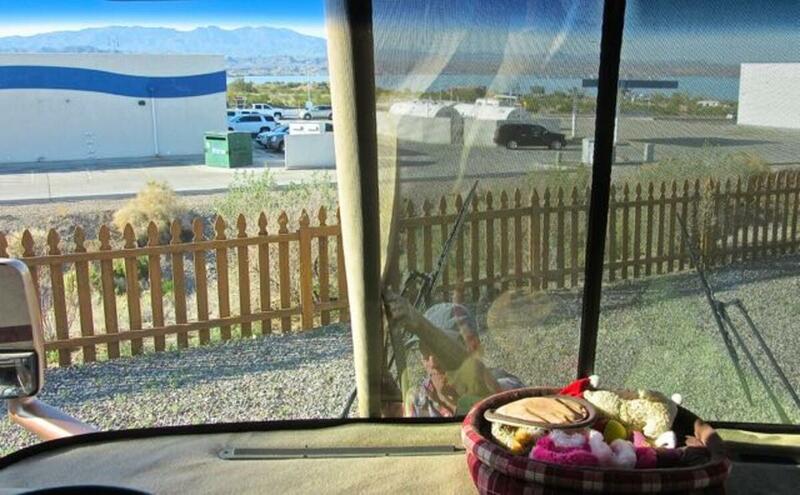 We only left our boondock spot at the Shell near Gila Bend at 8:45AM, after giving our big front window a thorough clean. By 9:30 AM we pulled over to the shoulder on I10 as we headed west. The tire sensors were shrieking and one of the Jeep’s tires was down to 16 PSI ( normal is 32 – 33 ) and decreasing quickly. Had we not had the tire sensors, we likely would have had serious damage to the Jeep. Within the few minutes it took to slow and pull over it was down to 12 PSI. Before tire sensors, the exact same tire, front right – passenger side, many years ago – over eleven at least, on our Grand AM was damaged to mere pieces of the steel wire in the tires and the brake pads, etc were all damaged. Colin said he would change the tire to the spare himself but could not get the lug nuts to budge. They were on too tight. I meanwhile decided to call Good Sam, our roadside assistance and get us some help. Well it took a full thirty minutes for me to get in touch with Good Sam. In the end I had to activate Colin’s Canadian cell to get thru. My iPhone with the Telcel SIM refused to work as did Fongo which is internet dependent. Fortunately we had Colin’s cell. The agent at Good Sam took forever and insisted they could not come out to help us as we were unsafe on the road (too close to moving traffic). 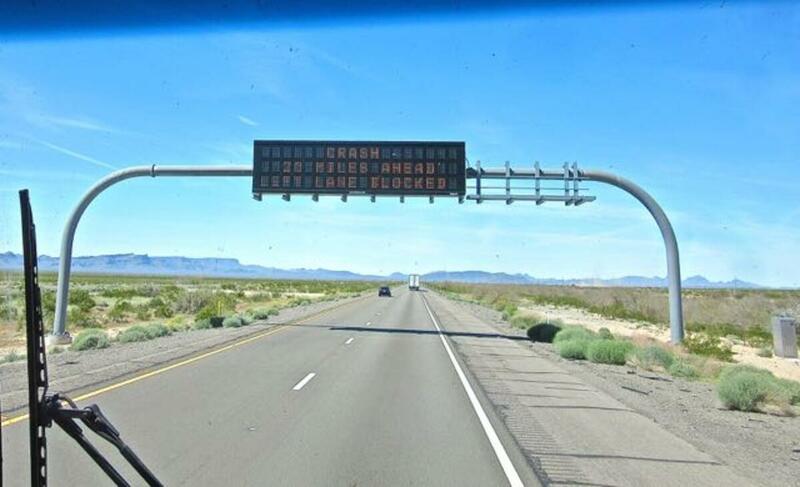 We were less than 3 feet from passing vehicles at 75mph. Colin took over talking to him while I was able to use my iPhone to call 911 and request the police to come out (Good Sam’s requirements). Once they were there then the tire repair people would be able to be sent out. Good Sam considers being 5 feet away from the white line to be safe. Colin did not want to move any further onto the shoulder as it was a mix of dirt and bits of gravel and he did not want the RV to sink. It did take over 30 minutes for the Good Sam agent to find us someone to come out to change the Jeep tire. He needed to know the numbers on the tire and all kinds of stupid ( in our opinion ) things. I mean, all we needed was a tire changed out for our spare, not a new tire ordered. We had a 90 minute plus wait for the tire service to show up. So moments before 11AM a vehicle stopped followed seconds later by a police vehicle. 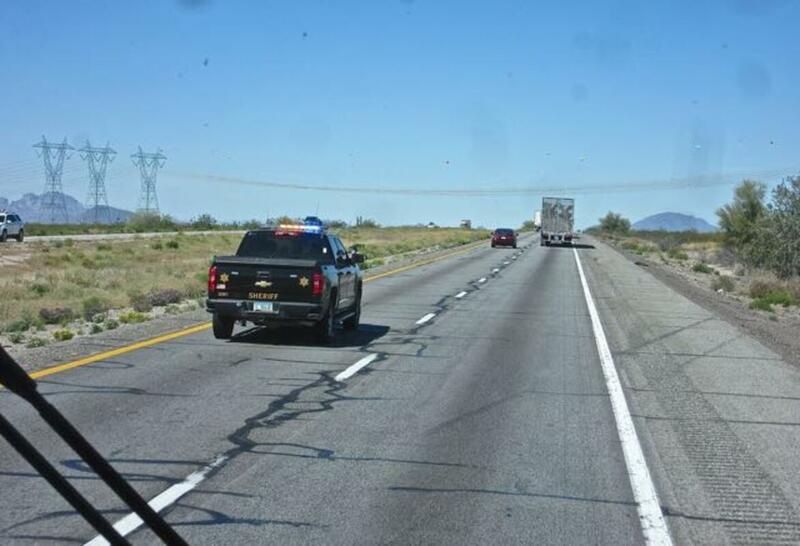 Immediately the frantic swaying of the RV due to semi’s passing by within a few feet at high speeds was greatly reduced. Traffic was moving over to the left lane which stopped affecting us. I seriously was getting nauseous from the swaying. 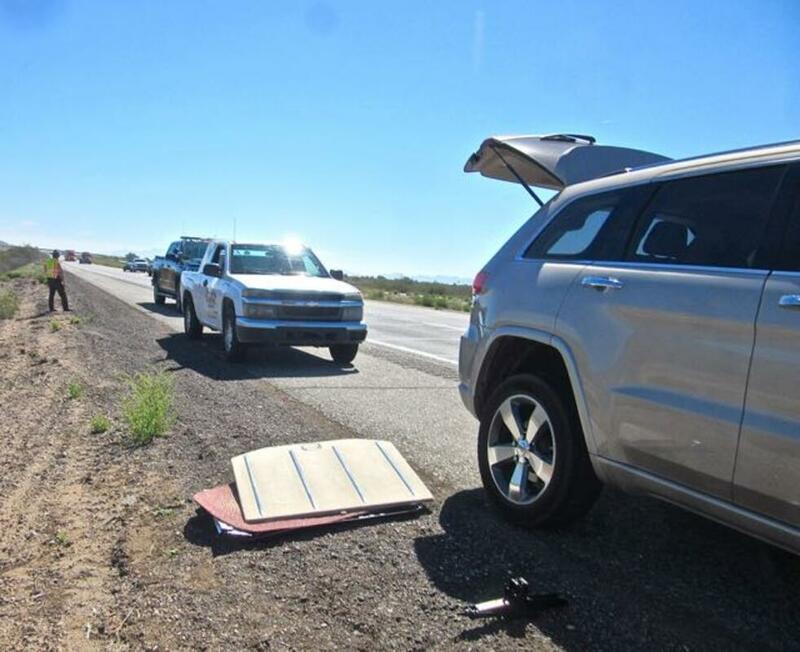 The first vehicle that stopped was a young lady named Sherry who asked if she could help. Turns out she was passing by on the other side of I10 and saw that we needed help so she drove to the next overpass and came back to us. We soon realized that she was not the tire service we were waiting for. She was still willing to help and said she had tools in her truck which we later saw was also a tire company, Hamilton Towing. She had the perfect jack as well as power tools that undo the lugs quickly. The flat tire was off and the new one on within 5 minutes. The police woman never uttered a word but did keep the vehicles in the far lane. She did stand very far away from her vehicle and was safe on the shoulder. I took this with my iPhone as Colin had the small camera outside. You can see how the police vehicle has everyone moving to the inside lane. Once the tire was back on the police woman moved directly into the right lane with flashing lights so that we had a chance to slowly start up and get up to speed, that was an immense benefit. Her help was greatly appreciated although she kept her distance. Sherry then moved from her position behind us into the fast lane. She refused to charge us anything for her help. Needless to say we tipped her and intend to contact her company and put a good word in for her. She went out of her way by at least by 12 miles with all her back and forth across the interstate. Meanwhile I tried to call the tire service that we were waiting for but they were not answering their phone. So I switched to Good Sam but I was on hold and eventually I was cut off once we lost cell phone signals. It took about 4o minutes but I was finally able to contact the original tire service. They had been out and said that we were no longer there. They of course will still charge Good Sam for the job that they did not do. Not too far down the road we saw this. 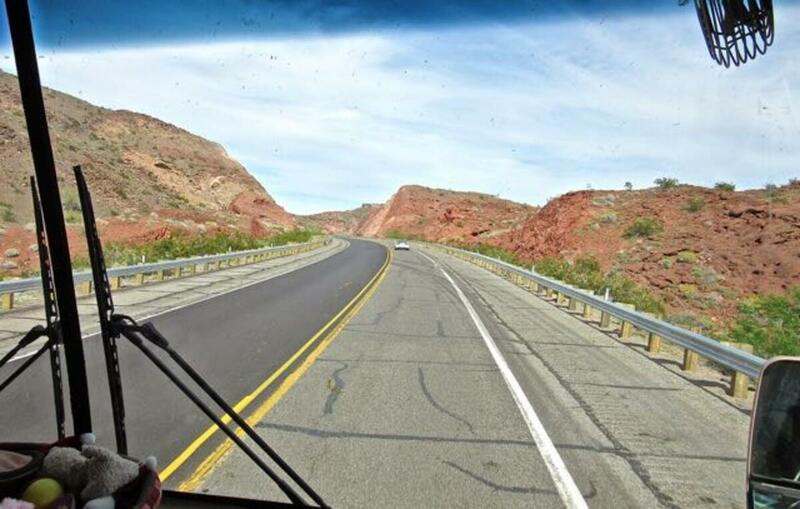 However we had the option of taking route 72 which bypassed Quartzite via Vicksburg @ exit 45. Sorry we missed seeing you Rick and Kathy. Hopefully next winter. We stopped at the Zip station right at that exit to get propane. 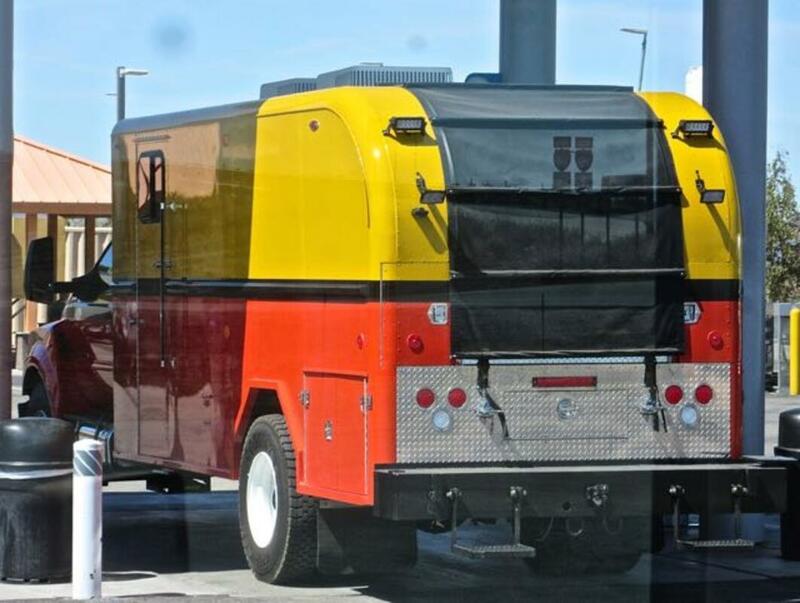 Interesting RV at the pumps. 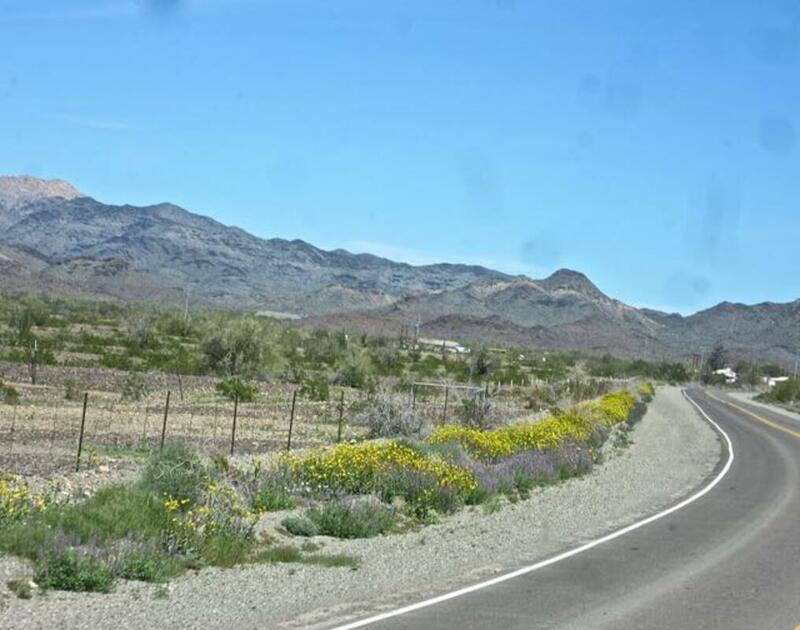 Back on the road about 12:30pm and seeing some wonderful wildflower displays. 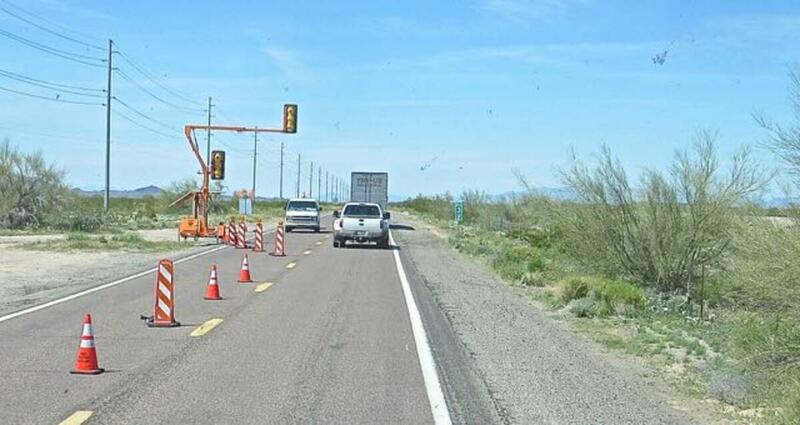 Most interesting traffic control system. 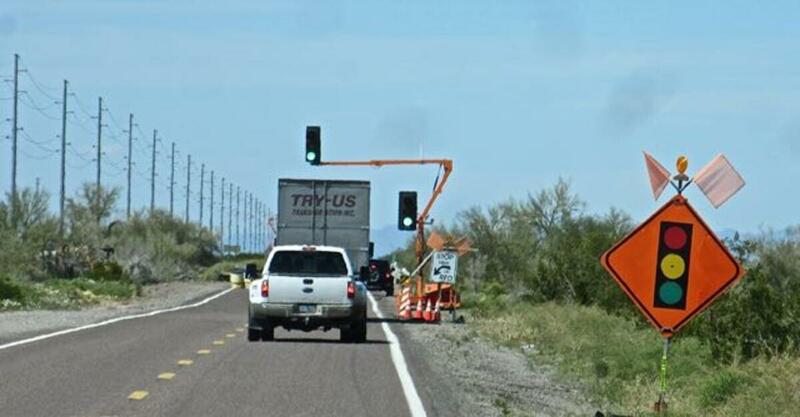 The automated lights control the flow of traffic. Once we drive through then the oncoming traffic gets to pass. Very efficient. Next stop Spanky’s in Parker. We needed a few things including some LED light bulbs. These are a very bright white color which I don’t like. The new dining table light and the bedroom sconces we changed out in October are also LED but a nice warm white light. 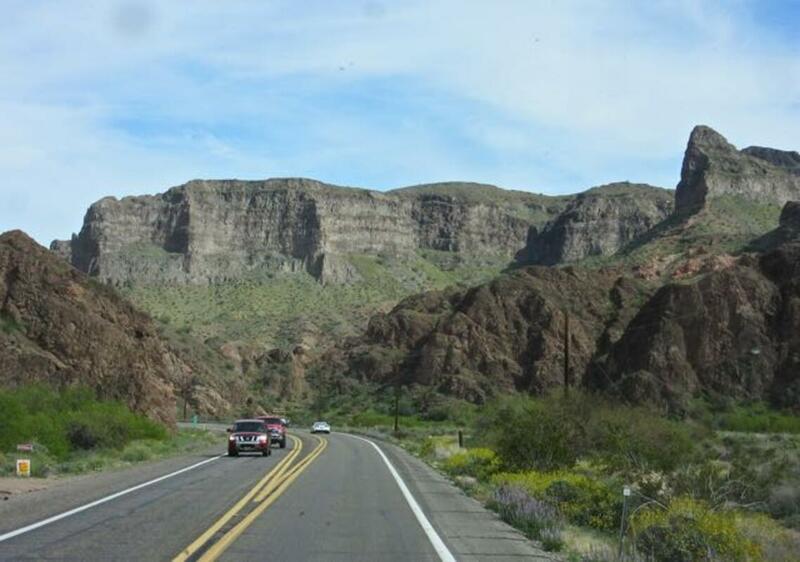 The drive between Parker and Lake Havasu is lovely. So much green this year. 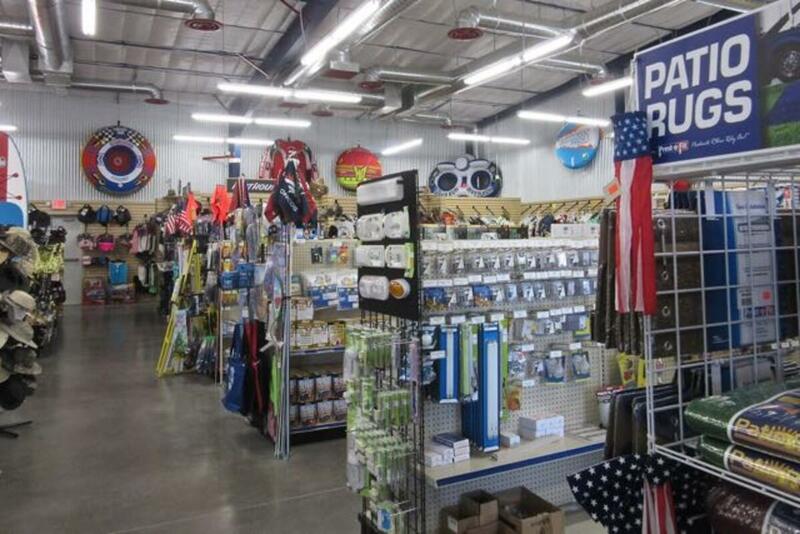 So once we checked in, got unhooked and parked the RV, I started to check out tire repair places. 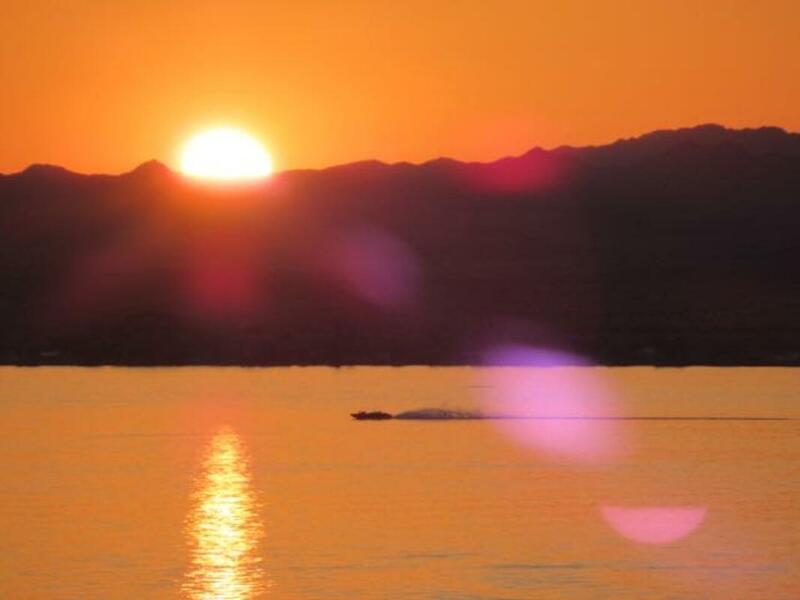 There are only two here in Lake Havasu. One had closed at 4PM and the other was closing in 25 minutes. 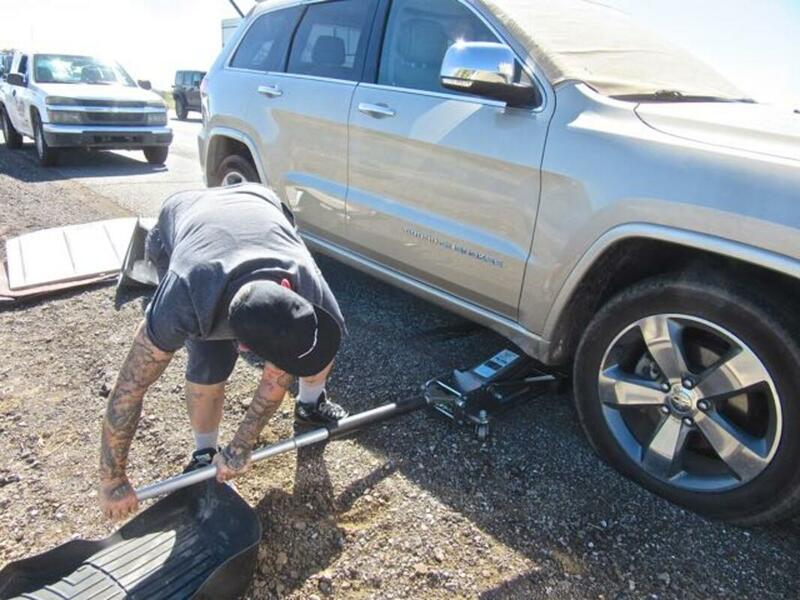 Colin quickly removed the tow shield from the Jeep and drove off to Discount Tire. Otherwise we would have to wait until Monday @ 7:30AM to get service and we are leaving Tuesday. What if we needed to order a new tire? This is his report of what transpired. 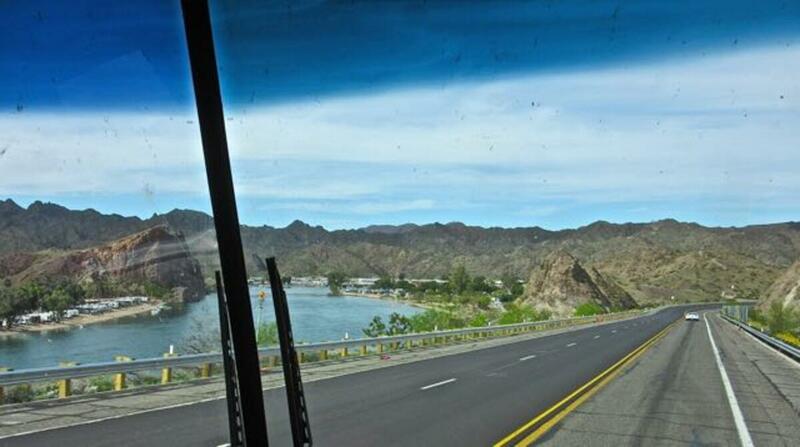 Arrived at Discount Tire, Lake Havasu at 4:40pm. They checked me in but did not start on the flat tire until 5:05. They lock the doors at 5 pm and will finish all jobs checked in before 5 pm. The flat was caused by a sharp stone wedged in-between the tread. They removed it, drilled a new clean hole and put a plug in from the inside. Then they polished the inside of the hub. The tire was balanced, checked and reinstalled. Then they checked all lug nuts and air pressures on the other 3 tires. All this took approx. 30 minutes. The car was driven to the front of the waiting lounge where I was given bottled water for my thirst. He gave me the keys and I asked where do I pay? He said “no charge, when you have a need for a new tire or you have a friend who has, we are here to help you” I was speechless. So as you can see, yesterday was a Good Samaritan day, between Sherry the tire service/repair lady and then Discount Tire here in Lake Havasu. This is where yesterday’s post came in. Such a lovely sunset. We were eating by 9PM and I was in bed by 11PM. Tired! We slept in again today and took our time easing into the day. Mostly computer catch up for me and some bill paying, and for Colin guitar time of course. He did clean the bugs off the front window and put our shade screen on. We face full sun on this site. We also got the Satellite dish up and hooked up the water, filled the tank and dumped the gray. We tore ourselves away to go do some clothes shopping but neither of us found anything we liked so headed over to Walmart for a few items like a water bucket and some romaine lettuce. 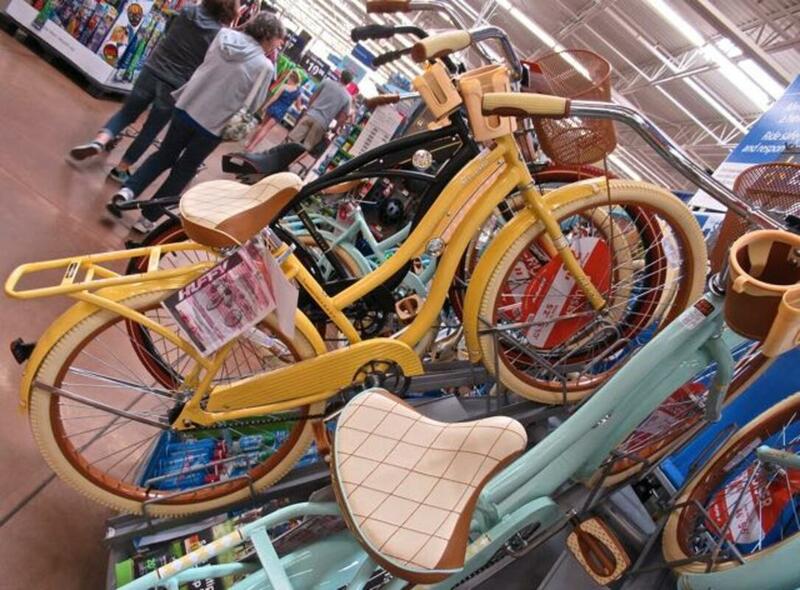 I loved these new retro bikes on sale for $148.00 each, complete with basket and a nice wide seat. Back home for a late lunch at 3PM which is our normal time. We did have a lovely back road Sunday afternoon drive back to the RV. The view directly to the right which we can see. It’s not the Isla but still a great sunset. My nose however is most unhappy. Colin’s is bleeding. The dry air is not allowing me to breathe properly. I am using either Carmex or Vicks VapoRub just inside my nostrils every 15 minutes in order to breath. Any suggestions. Go to Wal-Mart and get a mister to put moisture back into the air. At least you can run it once you plug into electricity. Great post by the way. You got lucky with your tire repair and service and are making good time. I find the Dry desert air much easier for me to breathe that the humid air by the ocean and back home. I wonder why? Yet Suzie has a runny nose in the desert, go figure. That dry hot air is tough, I don’t like it myself, that is why we always stay near the coast when in Mexico. 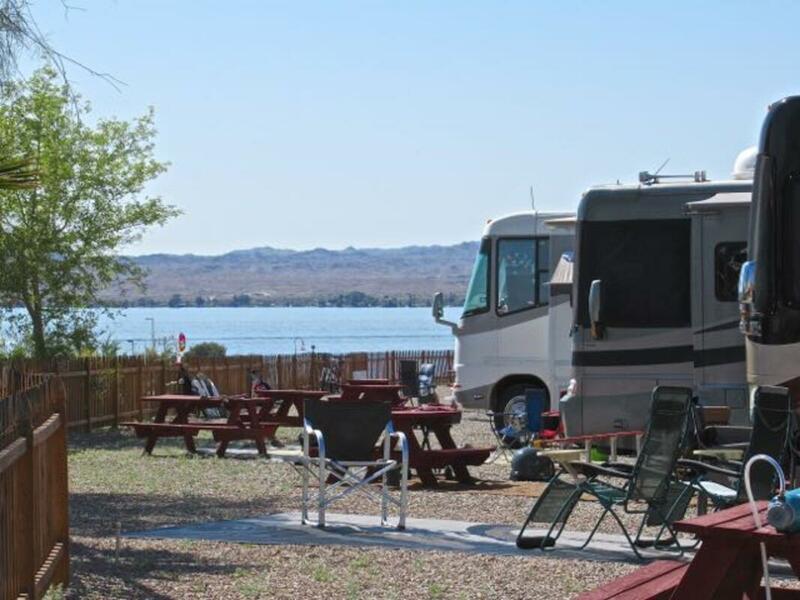 I have a friend who has a house at Lake Havasu and he is always saying to go there but we haven’t yet. Glad you got the tire issue sorted, our own tire shop fixes tires for free and we buy tires there now after I took my tire for a repair there the first time. Definitely a happy customer. Gracias, Adding moisture to the air around me did help as well. Well, we too are having “fun” on the road, lost a wheel off the RV (bad bearing) east of Monahans Texas, cost us some extra time (2 days) and some $$, it was good to have roadside assistance! Ouch!! Sorry to hear that. Hope all is well for the rest of your trip home. Get a spray saline solution at Walmart or Farmacia. It’s just salt water. Use as needed. I needed it for only 1 week in New Mexico, otherwise nosebleeds. We live in Tsawwassen. GS doesn’t always accept putting on your spare if they think it is not in good condition and they want to prepare to sell you a new one. Be prepared for something to come up from GS once you get home. Marcus is a real squirrel and his companies, in my opinion, cannot be trusted. Hopefully, you have always had good luck from them and will continue to. It was interesting reading your experience with Good Sam. They were fantastic when we broke down outside of Missolua, MT. We were even closer to traffic that you were, our tires were on the white line, and other than suggesting we call 911 for our safety they had no problem sending someone out. A Fish and Game officer came out, said we had done everything we could do … markers a ways down the highway and safety vests on … and then he left. We were at the top of a hill and despite the markers nobody pulled into the other lane. I can’t believe the tow truck driver didn’t get killed while trying to get us hooked up! How awesome of that girl to come back and help you, there really are nice people out there! 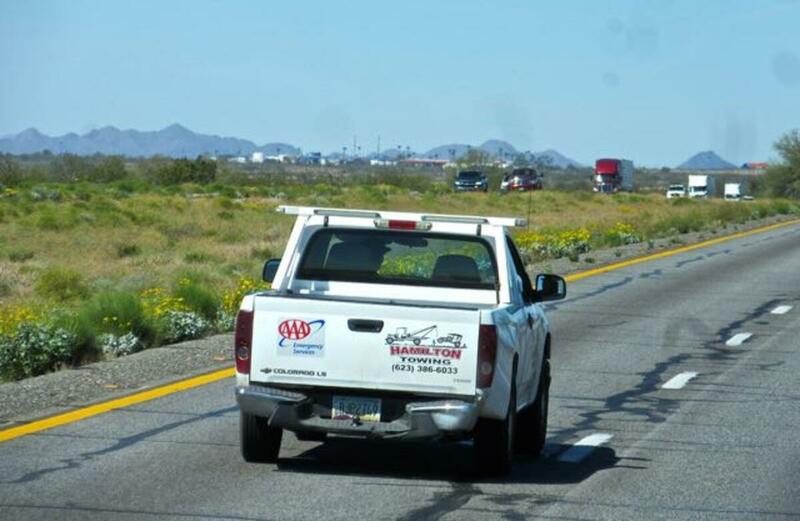 We too have had nothing but great service from Discount Tire – no matter where we travel. I am sure you will spread the good word about them. You had good luck while having trouble. First, that you stopped in time, second that the girl had the right tools and went out of her way to help and then having the tire fixed for free. I guess that area at I-10 is prone for problems. 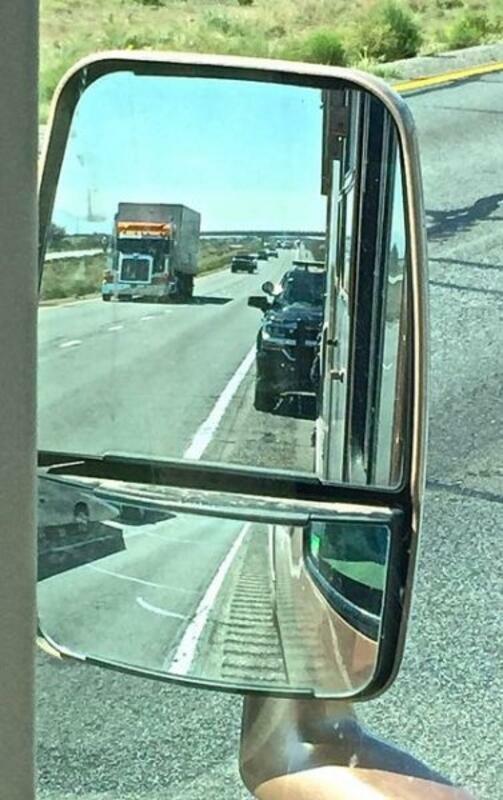 We had our own trouble there at the beginning of January and I could not believe all the truck and car racing by without moving over to the other lane when they see someone has trouble by the roadside. They probably have no idea what a wind surge does! 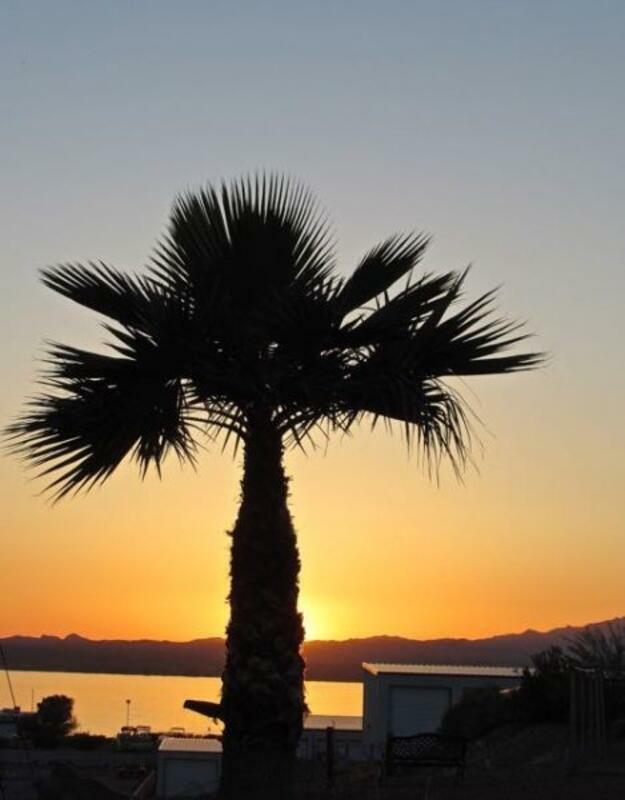 Enjoy Lake Havasu and safe travels. We stopped in time only because of our tire sensor system. 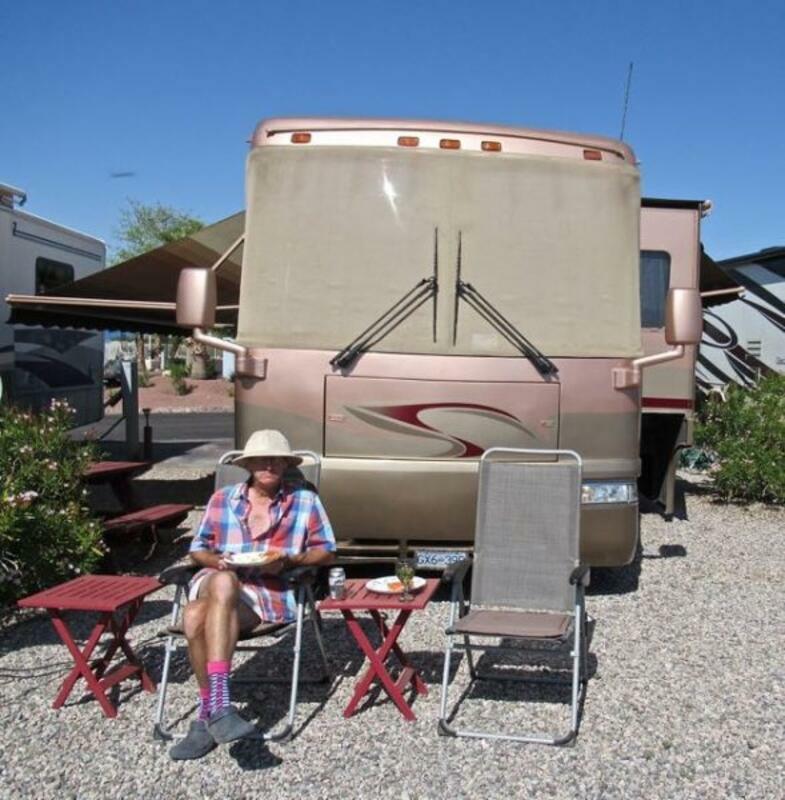 Not easy for any of us RVers have a problem on the road. That was sure a nasty experience with the flat tire. Glad you got it all sorted out.